TALLAHASSEE, Fla. (Seminoles.com) – The Florida State Women’s Basketball team has added another marquee opponent to its 2016-17 non-conference schedule. 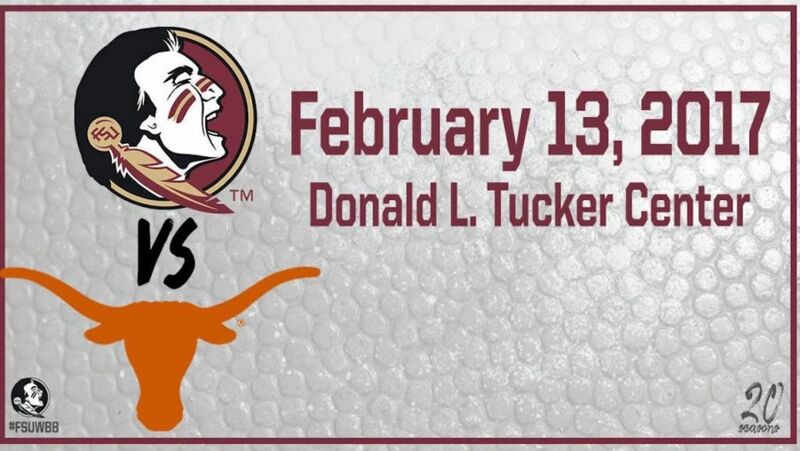 FSU will host Texas at the Donald L. Tucker Center on Monday, Feb. 13, 2017, at a time to be determined. The matchup in Tallahassee pits two teams with large expectations once again. FSU and Texas are two of just eight teams who have made consecutive NCAA Sweet 16 appearances in 2015 and 2016. In the ESPNW “Way Too Early” Preseason Poll, Texas is tabbed at No. 6 in the rankings while FSU is 15th. The Longhorns mark the sixth non-conference opponent FSU faces that made the NCAA Tournament last season. The other notables include four-time defending national champion Connecticut (Monday, Nov. 14, in Tallahassee), Jacksonville (Thursday, Nov. 17, in Tallahassee), James Madison (Sunday, Nov. 20, in Tallahassee), Minnesota as part of the ACC/B1G Challenge (Wednesday, Nov. 30, in Minneapolis) and rival Florida (Thursday, Dec. 8, in Tallahassee). Both Texas and FSU bring in ESPNW Top 10 recruiting classes for the upcoming year. Under head coach Sue Semrau, who enters her 20th season at FSU, the Seminoles have never faced Texas. The two teams met once on Feb. 25, 1984, at the Northern Lights Invitational in Anchorage, Alaska. Texas came away with an 89-43 win. Season tickets for the 2016-17 season are on sale now. Tickets are once again very affordable and come with excellent perks for both reserved section and general admission seat holders. Find out more information on season tickets by going onto Seminoles.com or by calling the FSU Athletics Ticket Office at 1-888-FSU-NOLE. Florida State’s full schedule which includes the ACC portion will not be released until later this summer. Es Oficial! Romero and Rodriguez are Rio Bound!